The coalition's letter to help "Dreamers" will be featured in a full-page ad in The New York Times today. The term Dreamers refers to individuals who were brought to the United States at a young age when their parents or guardians illegally immigrated into the country. Under the Deferred Action for Childhood Arrivals (DACA) program, these people are protected and can gain legal work status in the United States. "With the re-opening of the federal government and the presumptive restart of immigration and border security negotiations, now is the time for Congress to pass a law to provide Dreamers the certainty they need. These are our friends, neighbors, and coworkers, and they should not have to wait for court cases to be decided to determine their fate when Congress can act now," they wrote in the letter. "We have seen time and again that the overwhelming majority of Americans of all political backgrounds agree that we should protect Dreamers from deportation," the letter said. "American employers and hundreds of thousands of Dreamers are counting on you to pass bipartisan, permanent legislative protection for Dreamers without further delay." Apple and <!---->Tim Cook<!----> have been supporting DACA for years, and Cook began writing letters in support of the Dreamers in 2017, after President Donald Trump announced his original plan to phase out DACA over the course of six months. At the time, Cook said that 250 Apple employees are Dreamers: "I stand with them. They deserve our respect as equals and a solution rooted in American values." <script async src="https://platform.twitter.com/widgets.js" charset="utf-8"></script></center> In early 2018, Cook joined more than 100 CEOs in a letter urging Congress to protect DACA. The cause has been renewed this week as the United States government heads into another potential shutdown this Friday. Apple has spent increasing amounts of money lobbying the Trump Administration, in 2018 alone spending $6.6 million and in 2017 spending $7.1 million. 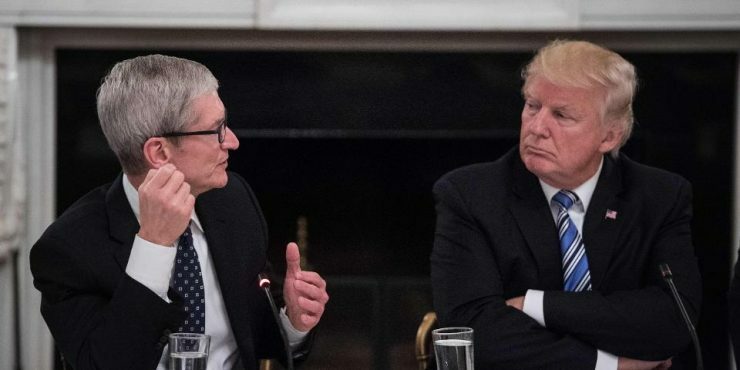 Apple's lobbying increased significantly after Trump took office, with the company spending more than ever before to influence the current government on issues such as privacy, education, climate change, trade, immigration, tax reform, and patent reform.